It was a beautiful (cold!) walk in the snow-covered woods for our third year participating in the Christmas Bird Count (CBC) in Glen Providence Park! It was refreshing to start early on a crisp Saturday morning, and the four of us enjoyed fun conversation while looking and listening for birds. We were particularly charmed by watching Golden-crowned Kinglets and Brown Creepers. There was a lot of bird activity in an area by the pond, probably in advance of the impending snow. Just as we were finishing, the snowflakes began to fall! Our final count totaled 69 birds of 23 species. While it was our third year, it was the 114th year for the CBC- the world’s longest-running Citizen Science survey! It was too overcast for good bird photos- but you can see photos of many of these species in our Wildlife Album on Facebook. 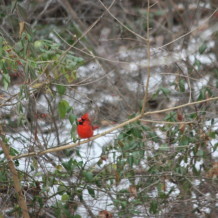 You can compare it to the lists from our 2011 and 2012 Christmas Bird Counts!